June is one of my favorite months of the year in Seattle. The weather is gorgeous, baseball is in full swing and there are plenty of outdoor activities to keep the animals in your house occupied and worn out. One of my favorites is Seattle’s many neighborhood farmers markets, which are finally open for the summer. The markets are perfect if you enjoy fresh local produce, great food options, or just like to get out and experience the community. Last Thursday, my wife and I were looking for something to do to get the kids out of the house and pick up dinner at the same time. 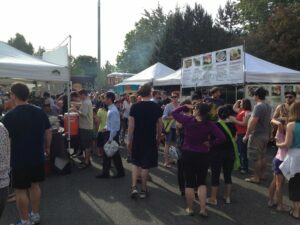 Luckily, the Queen Anne Farmers Market is only a block from our house so we packed everyone up and walked over to grab some food and enjoy the great sense of community that exists at the market. More than 20 local farms are on hand selling Washington produce. From apples to onions, raspberries and blueberries to fresh eggs, there are options galore. If fresh fruits and vegetables aren’t your specialty, there are many artisan foods stands, local restaurants and food trucks from which to choose or you can simply sit and enjoy the live music. For us, my kids love the fresh raspberries, while my wife enjoys looking through the many great vegetable stands. I, however, generally go straight to Veraci Pizza and then to Molly Moon’s for some amazing ice cream. OK, no surprise but my wife and kids love Molly Moon’s, too. While pizza is great on most occasions, I made a game time decision last Thursday and went with a pulled pork sandwich from the Raney Brothers BBQ food truck. My highlight last summer was trying a pelua arepas (shredded beef and cheddar on a corn cake) from Chicarepa, a Venezuelan establishment. 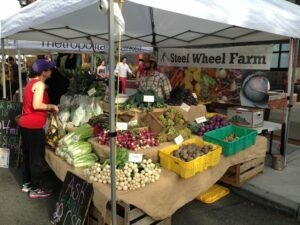 In addition to the Queen Anne farmers market, be sure to check out the markets in the University District, West Seattle, Broadway, Columbia City, Phinney, Lake City and Magnolia. The markets are a great way to experience the many neighborhoods of Seattle while supporting local farms and healthy eating. 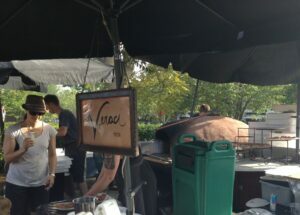 When you can’t take the animals to the farm, stay in the city and let them roam in our many great farmers markets.